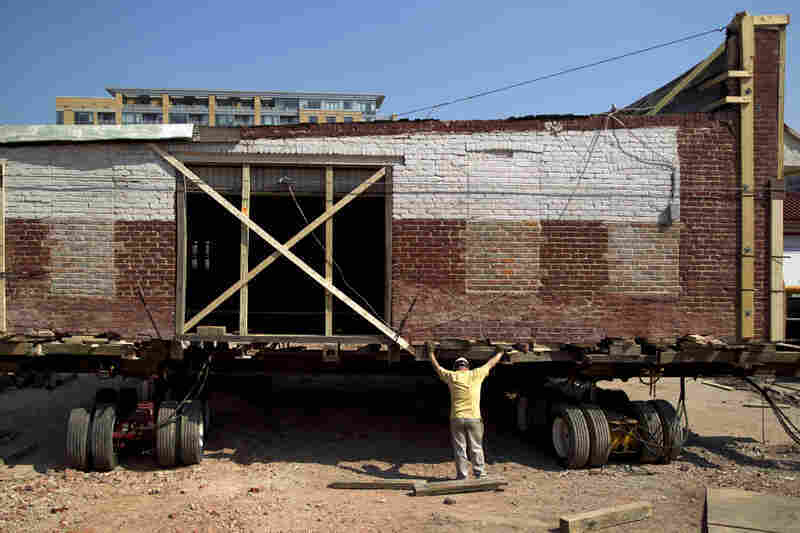 Moving Buildings To Save D.C.'s Historic Foundation A few months ago, six old brick buildings in the nation's capital were picked up and moved. Literally. Five of them will return as parts of a sleek new office building, re-creating the old streetscape while also transforming it. The massive project raises a question: What's important to keep in a city, and what should just be replaced? 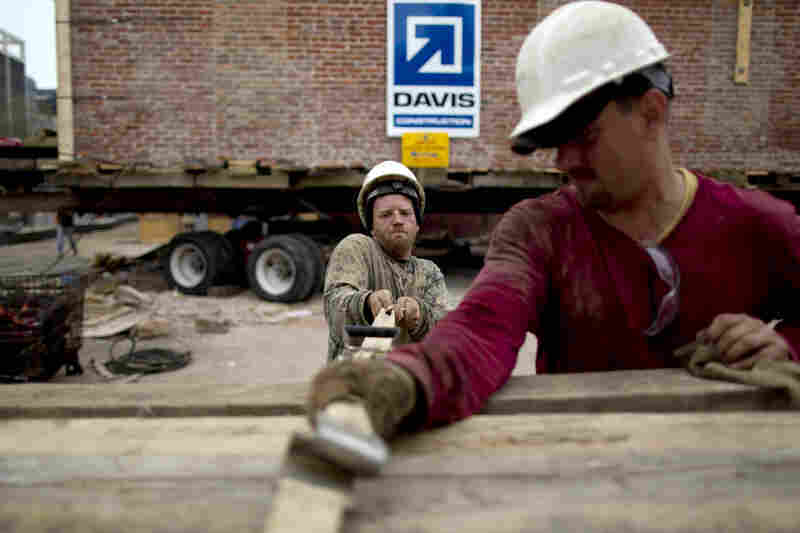 Construction workers walk by the site of a major building-moving project behind NPR headquarters in Washington, D.C.
Workers tighten straps in preparation for the move. The brick buildings, dating to the 19th and early 20th century, will be preserved. 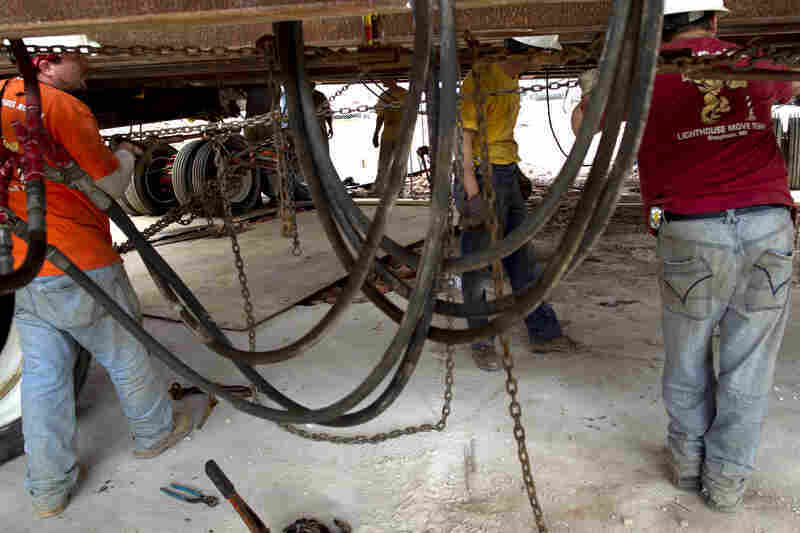 Workers position platforms with tractor-trailer-size tires under a building. The buildings will be incorporated into a multimillion-dollar construction project on the same site. A view of a building on the move, from NPR's roof. 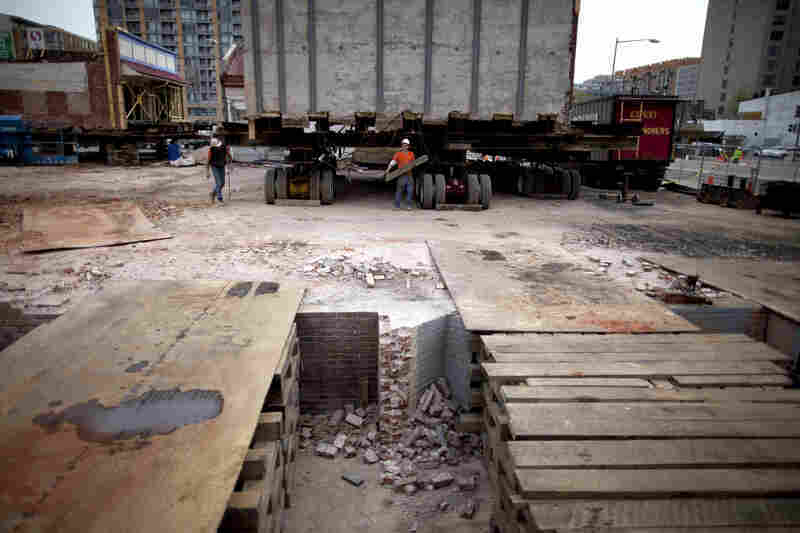 It takes considerable time and manpower to move the buildings, which weigh at least 60 tons. Instead of just moving the facades, the depth of the buildings is also being preserved. Once the buildings are lifted, they are moved by remote control. According to Gabriel Matyiko, vice president of Expert House Movers, this job is pretty small potatoes. The company has moved lighthouses and even an airport terminal in Newark, N.J.
With the old buildings out of the way, construction will begin on a huge glass-clad office building for the Association of American Medical Colleges. The 11-story-tall building will cost more than $200 million and incorporate the historic buildings. K Street may be synonymous with Washington, D.C.'s thriving lobbying industry, but for decades, K Street between 6th and 7th streets NW has been a dilapidated city block of 19th and early 20th century brick buildings. In recent months, staffers at NPR have witnessed the transformation of the entire city block, located behind NPR's Washington headquarters. 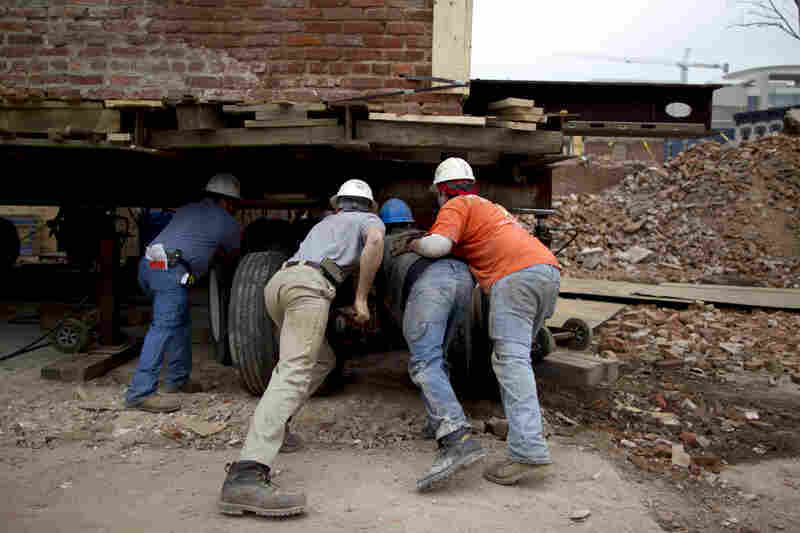 Six historic structures were jacked up one by one and rolled out of the way. Five of those now sit on one end of an empty plot of dirt, waiting to be transplanted near their original spots on the block, which will be the home of a new 11-story, glass-clad office building for the Association of American Medical Colleges. But unlike most urban development projects that get rid of old buildings to make way for new ones, the new AAMC building will incorporate these old brick buildings as new restaurants and retail shops, re-creating the old streetscape while simultaneously transforming it. The $200 million-plus project raises questions of what's important to keep in a city and what should just be replaced. These old buildings of the 600 block of K Street NW have seen far better days. Before they were moved, a hulking two-story, yellow-brick garage built in 1918 sat at one end of the block, and at the other end, a squat car wash that was once an auto shop. Midblock sat a couple of faded grande dames. There were also three skinny Victorian-era row houses. Most recently, one was known to be a brothel. The car wash was the first building to be moved, and it took hours to transplant it 40 feet. But crew member Kevin Kolb of Expert House Movers says these old brick structures are worth saving. "Brick is solid. It wears. It has age," Kolb says. "It's like an old man's face. There are lines and wrinkles in it. But you know, you can power-wash that away and clean it." 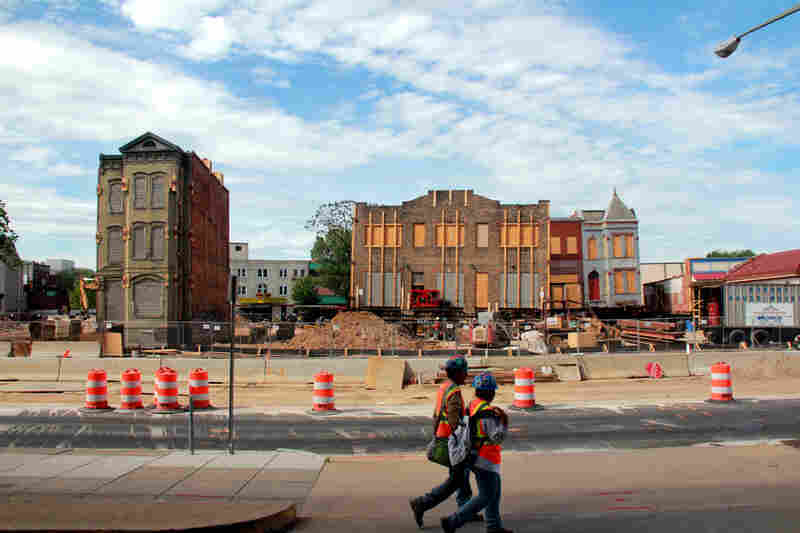 The AAMC project is saving not just the building facades but also most of the depth of the buildings — a historic preservation strategy welcomed by Rebecca Miller, executive director of the DC Preservation League, who says "facade jobs" became rampant in Washington, D.C., in the 1980s and stuck out like sore thumbs on revitalized city streets. Miller says the value of historic buildings, like books, should not be judged by their covers. "A lot of things have to do with the history of the building," Miller says. "There could be some very nondescript building [that has] this wonderful history behind it." According to Miller, the nondescript buildings of K Street NW tell the story of a once-thriving German immigrant neighborhood and the early automotive era, as nearby streets became a commuter corridor. Miller's organization thoroughly researched these buildings and prepared paperwork to nominate them for national historic status. 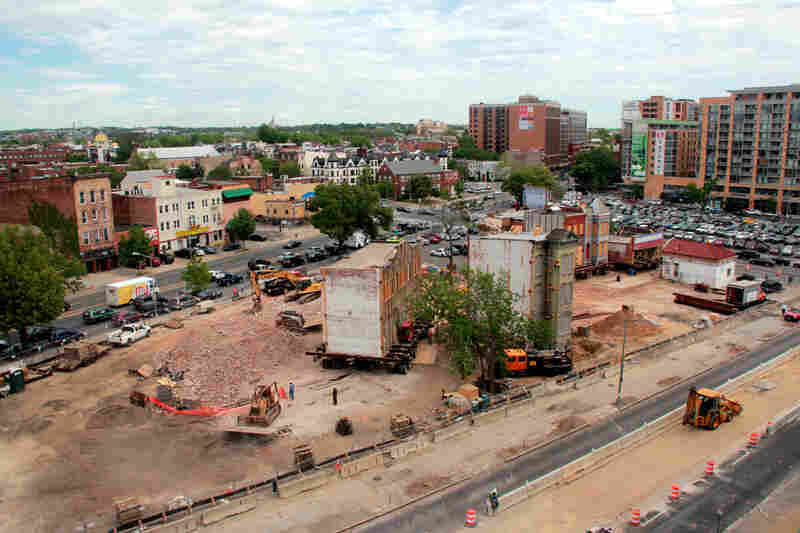 Preservation often complicates developers' plans with restrictions, permits and legal fees. So that background work also gave Miller leverage in any potential clash with developers. But in the case of the AAMC project, there was a negotiation, not a fight. The DC Preservation League compromised with developers at Douglas Development Corp. on saving these structures without historic status. Negotiations were not too contentious because it turns out this developer likes saving old buildings. Paul Millstein, the gung-ho head of construction at Douglas Development, says he was amazed by the concept of moving buildings to preserve them. 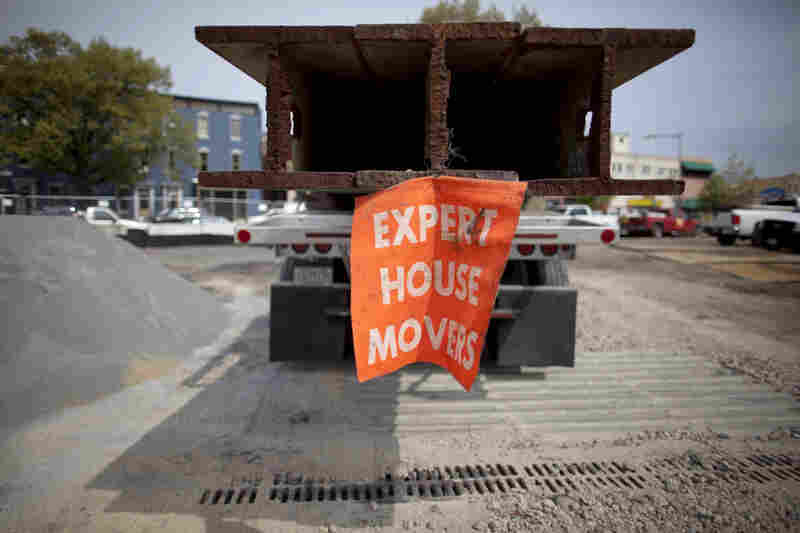 "You know, people move a house [or] they move a table. [But] we're moving buildings! I mean, what could be more exciting?" he asks. But Millstein admits projects such as this one — combining old buildings with new — are impractical, and they scare lenders away. "There's not an institution or financier or lender out there that we've ever been able to convince these make sense," Millstein says. "[There are] so many things that can go wrong from moving structures." Still, even though it's costing millions to move these old buildings and incorporate them into the new one, Millstein sees a real benefit. "I think it makes the buildings richer. It gives them a better feeling. They have the feng shui to them," he says. 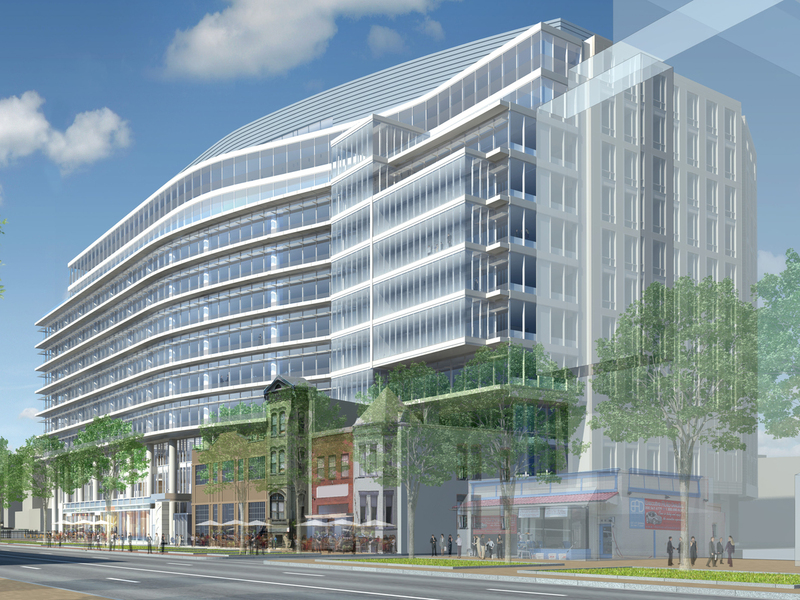 An artist's rendering of the future headquarters of the Association of American Medical Colleges shows how old brick buildings will be incorporated into the new building in Washington, D.C.
Shalom Baranes is the architect of the new building. His sweeping contemporary design has space carved out for this motley assemblage of old brick. He says incorporating the old structures into the new building is "a little bit like placing a speck of sand in an oyster," ultimately "deforming" the structure — but in a good way. "I think it makes for a much more exciting urban landscape. You sense time," Baranes say. "One of the great things about living in the city is that it has this fourth dimension of time. As you walk down the street, you sense what was done 100 years ago, 50 years ago, and those are things we don't want to lose." "I am taking a picture of the history," says Kebrab Tekla, an immigrant from Ethiopia, as he stands outside the chain link fence surrounding the construction site, taking photos with his cellphone. Tekla lived on this block for 25 years, back when the neighborhood was a crime-ridden wasteland. He rented the house for many years before buying it for about $300,000. 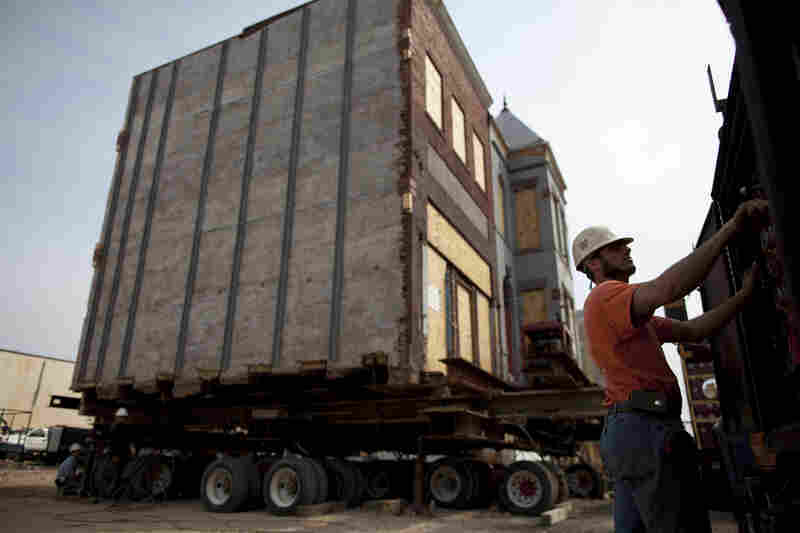 He was paid more than $2 million to move. Tekla was the last property owner to sell, and his house was demolished. But he did manage to save a bit of it. 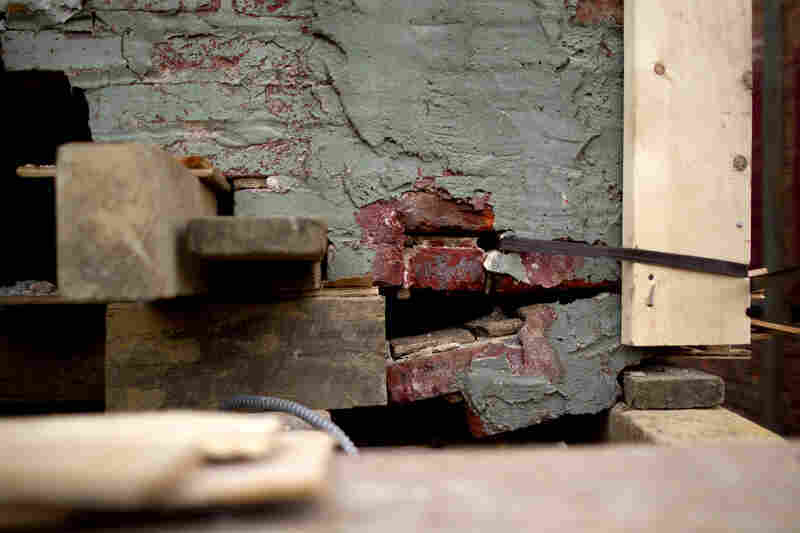 "I saved some of my house bricks, so I have contact with them every day," Tekla says. "It's history because all my children [were] born in this house and my father, he died in this house." 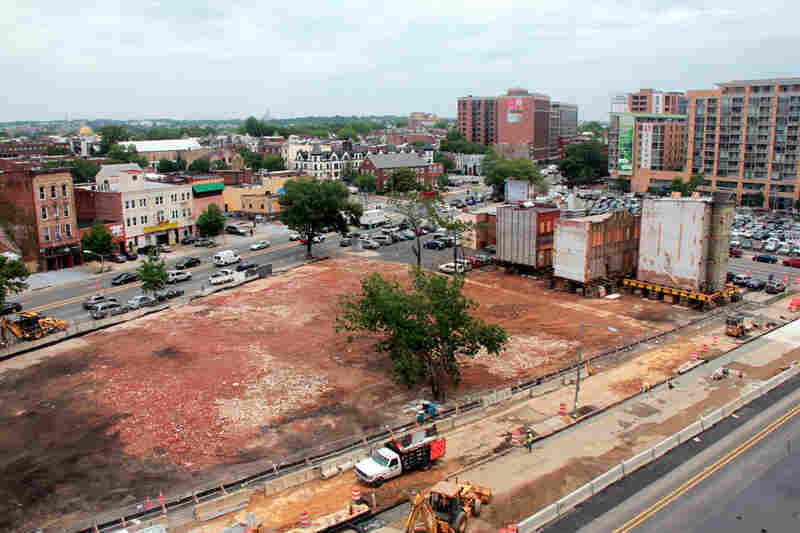 That history is being rewritten as this part of Washington, D.C., undergoes massive change with new development built around signposts of the city that used to be.